When I was pregnant with Roswelle, I splurged on maternity clothes. It was my first pregnancy and I was so excited to finally shop for the growing baby bump! This time around, I'm shopping a little differently. I still wear maternity jeans (when I'm pregnant, I'm very pregnant, so there is no way around that) but I have tried to buy as few maternity tops as possible. Actually, not one of the tops pictured below is maternity! My method is to buy tops with giving material, extra long styles, or one size up. With the less fitted look currently in style, these tops should last me well after baby. If I couldn't find the exact top available online, I did my best to link a similar style. My "spring is around the corner but it's still freezing" look. When pregnant, the last thing I want is a bulky, heavy, knit sweater that is going to make me look even bigger. This light knit and off the shoulder top keeps me warm while keeping things light. Also, apparently baby blue is the color of the moment? (as read here). I've also been wearing my white jeans all winter long. I have officially left the "after Easter/before Labor day" rule behind me. Nothing makes me feel better than throwing on a striped pattern top. The classic look can be played up or down and is appropriate for almost any occasion. This top is not maternity, but the boxy/flowy cut allows plenty of room for my growing belly. I'm loving the "rough cuff" jean trend lately and don't want to miss out! I literally cut these jeans right before taking the pictures. I found my old navy skinny maternity jeans and cut/ ripped the ends off the legs. They aren't perfect - but I'm kind of in love with them! I paired a pale pink, soft shirt to compliment the roughness of the jeans. Not seen is the black choker I wore for the look...there is a reason I'm looking down or away in most of my pictures - my jaw line tends to disappear when I'm pregnant and I can't stand straight on pictures of myself! eek. Two trends in one...denim on denim and bell sleeves. I ordered this top from Vici Dolls in a large. As it's no longer available, I linked another similar top from Nordstrom below. Also, with the big sleeves, I decided to keep it balanced by pulling my hair up in a messy, understated braid/bun. THIS is the outfit I wear almost every single day. 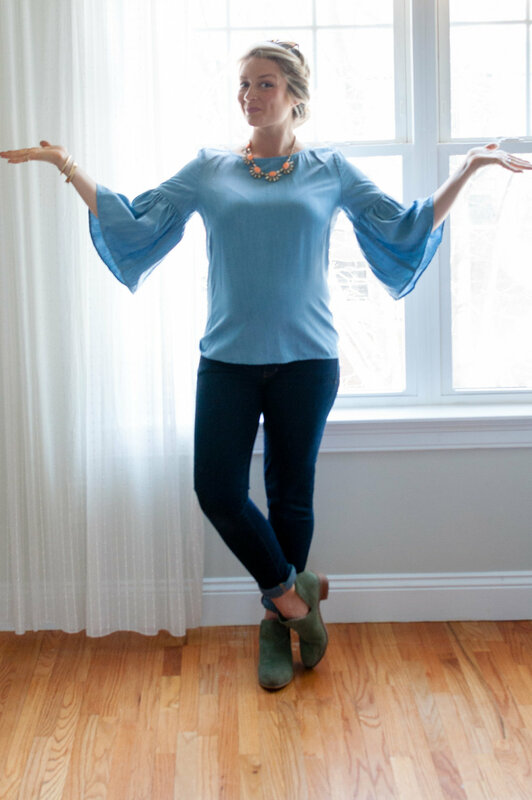 The Emma top is my favorite non-maternity top as it is stretchy, comfortable, long, and affordable! I buy them at shopdressup.com. The pants are lululemon's "barely tight", I bought two sizes up to give myself and baby plenty of room. The all-white shoes are fun and comfy for running after Roro all day.